Increase your vocabulary and you’ll make your writing much more precise. That’s why I provide a word of the week. Today’s word: shambolic…. He seemed, to me, sloppy. Too relaxed, shambolic. But I was intrigued to learn the etymology of the word. Oh, my. What a long and twisting history it has had! Shambles goes back to Old English, when it meant a stool or a footstool. There were a multiple of spellings including sceamel (the Old English sc sounded more like the Modern English sh.) But by the 1300s, shambles meant a table or stall where meat was sold. Later, it became a meat market and by the mid-16th century it had become a slaughterhouse. Because butchery is messy, it’s thought that the word eventually took on its modern sense of ‘great confusion’. His office in Printing House Square is so impeccably tidy that it is … a standing reproach to the standard image of shambolic newspaper offices. 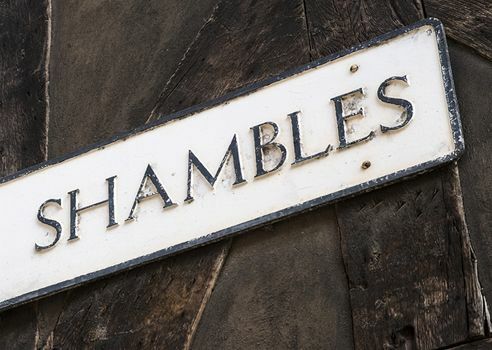 Interestingly, there is a street in England’s historic city of York known as Shambles. (That’s a street sign from the city at the top of this post.) The street is now clean, quaint and beautiful as you can see here.